Roasted red peppers are a classic Italian offering and this recipe uses the whipping siphon to aerate them into a light, smooth soup. The amount of agar can be adjusted to easily control the thickness of the soup. I prefer making my own roasted peppers but high-quality store bought ones can be used if you are in a pinch. In addition to serving it as a soup, this foam can be used in many different ways to turn traditional dishes into modern masterpieces. It's great on fish, asparagus, or even steaks. 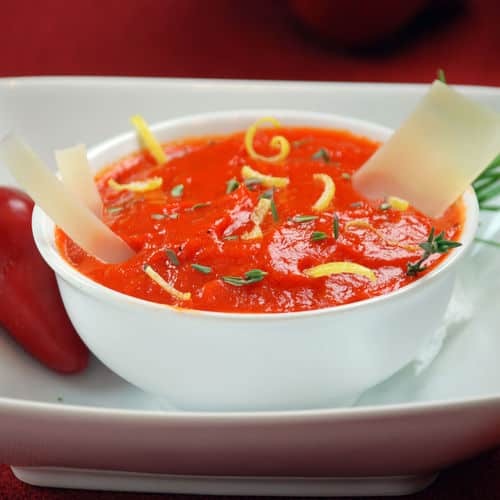 If you would like more information about the modernist techniques, ingredients, and equipment used in the roasted red pepper soup recipe you can check out the following. Toss the red peppers with the olive oil then salt and pepper them. Cook them on a grill, or in a hot oven, rotating as needed, until the skins begin to blacken then remove from the heat. For a more refined presentation the charred skin can be peeled off, though sometimes I leave them on since the char adds a pleasant bitterness to the foam. Combine the roasted peppers, garlic, thyme, and water in a pot. Bring to a simmer then blend well. Strain the puree and set aside. 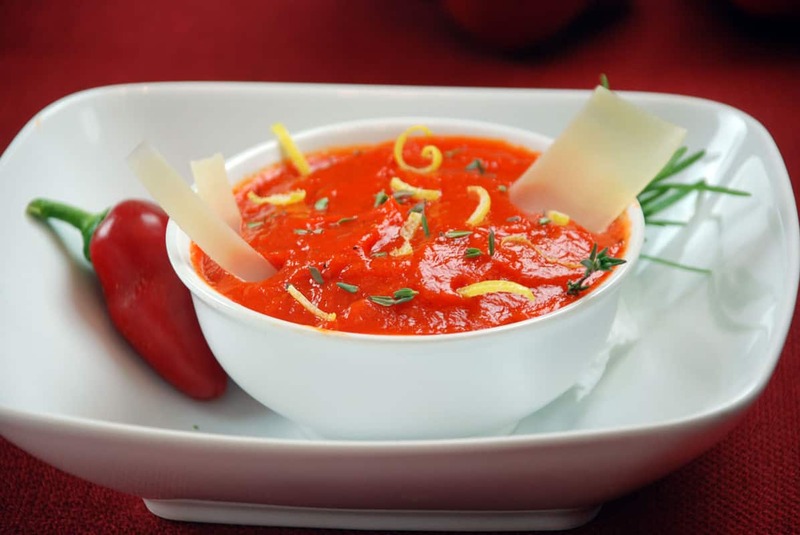 Blend the roasted red pepper puree, water, and agar together. Pour into a pot and bring to a boil. Let simmer for 3 to 5 minutes then pour into a container and let it set completely. Once it is set, cube the gel and puree with a blender until smooth. Add some water if you need to thin it. Pour the fluid gel into your whipping siphon and charge. When you are ready to serve, dispense the foam into bowls. Garnish with the lemon zest, thyme leaves, and parmesan cheese strips. Roasted red peppers are a classic Italian offering; this recipe uses the whipping siphon to aerate them into a light, smooth soup. This foam can also turn traditional dishes into modern masterpieces!